harp wrote: Hopefully, this was not a rogue run.... see what the ensembles show. GEFS backs it operational up but with the axis of heaviest accumulations along the red river into Oklahoma but bottom line is there are plenty of members singing the same tune - increasing odds for a major winter storm early next week!! Of course, that's how ensembles work...they'll improve as you get closer. Things to note on this storm @ 180hrs. Where is the HP? feel like the models have this wrong. Energy pouring down through the upper midwest but the surface pressures dont look right and the high is way up near the arctic....Could it be much colder than it's actually showing? Heights over Alaska are increasing over this period, which helps the source region for our cold air. This could be the most important thing to watch. With this subtropical system near Hawaii, it could cause issues for the models, but if you look at the upper level high near alaska, for some reason, it didnt look right to me. I felt like it should be poking up into Alaska to near the North Slope. Thats just me though, these models are smarter than me. GFS continues to show the storm deepening into Texas. Lets hope the trend continues. Also, BEWARE! It's still over one week out and we know this storm will disappear around the 5 day mark. You have to pardon my rambling. I usually look at very minute things in the Pacific for tales on what happens in our weather. Super promising. Most of them have moisture and quite a few have a nice snow storm. Any forecast I make is based on my opinion only. Please refer to the NWS or NHC for official forecasts. Certainly interesting with cold coming in and trough coming out with the Euro. It may or may not show much but good trends today. Ntxw wrote: Certainly interesting with cold coming in and trough coming out with the Euro. It may or may not show much but good trends today. Yes, deeper/slower trend is what we want to see (but not too far as to cut it off)...not the faster/progressive trend of the past 3 years it seems! The Euro looks terrible for precipitation across Texas for the next 10 days with the exception of far east Texas. Hopefully that changes. The daily fog,mist and drizzle is quite annoying. It needs to start actually raining. Its getting pretty dry! I am hopeful with El Nino further developing that the atmosphere will start coupling soon and spring will get active! Here's a comparison between the 00Z and 12Z Euro as far as snow accumulations in Texas. Euro doesn't agree with the 12Z GFS at all. No FV3-GFS yet. It performed better than the GFS across TX with the past system. Here's a comparison of predicted temps from the Euro (top) and GFS (bottom) for the D-FW area. GFS is quite a bit colder. I'm not buying the 12Z GFS run at all. Big blob of rain moving into DFW. Looks light but could last a couple hours. 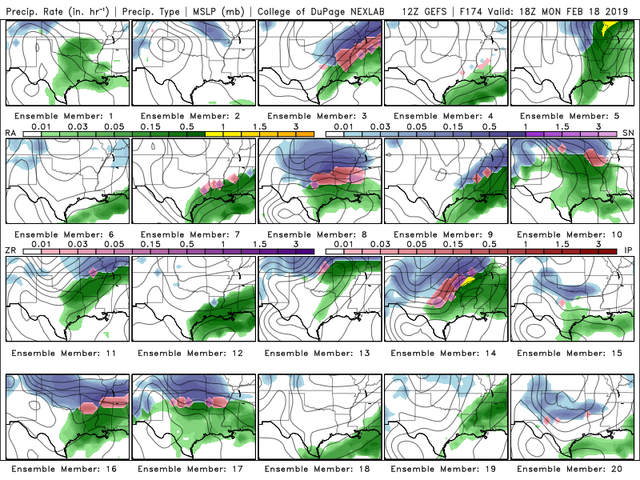 Here are the GFS ensembles snowfall predictions for D-FW. 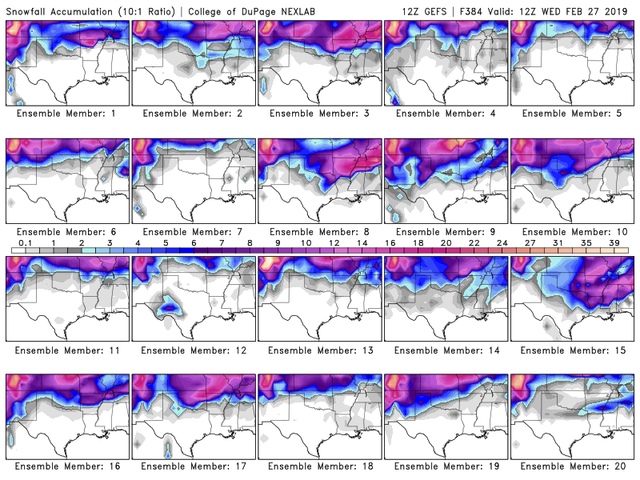 13 of 20 ensembles members indicate SOME snow (trace or more). Two indicate "snowmageddon". No EC ensembles in yet. Canadian model says "the GFS is on crack". It indicates mixed precip after FROPA, less than last week. I'm not too fond of the EPS snow forecasts...they've been extremely unreliable lately! I'm positive one of these will be correct! Consistency is somewhat lacking, to say the least.